Delight the visual and tactile senses with this soft, plastic Flex Ring that has rounded disc 'beads'. 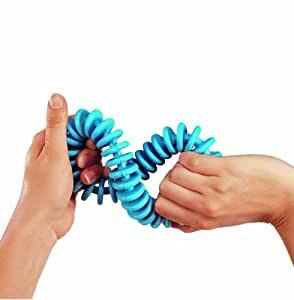 Easily bent, twisted or squeezed, it is great for developing bilateral and eye/hand coordination. Not only is it ideal for tactile stimulation, it is also safe to chew on. 6"diameter. ordered for my daughter as a fidget, but it was not soft and flexible enough. It felt more like a dog toy than a fidget. Only twists as seen in the picture, not really flexible. 5.0 out of 5 starsVery sturdy. This is much bigger than I thought. Very sturdy. Not very pliable and has a rubbery odor. My son is on the autism spectrum, and he showed no interest in it.